I had a lovely surprise yesterday. 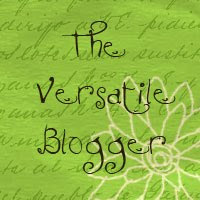 I received a Versatile blogger award from a lovely lady in Lebanon (I LOVE that the internet brings crafty people all over the world together.) Thank you so much Sucrette! And thank you for reading my blog. Now, there are a few rules that come with this award. 1.Thank the person who gave you the award. So thank you very much Sucrette. Her blog is well worth a visit. She has some wonderful free crochet patterns. I only wish I could crochet so I could try some out! Pop along and visit Le Monde de Sucrette. Pass this award along to 15 bloggers who you think are fantastic for whatever reason. 4. Contact the bloggers you pass the award to. 1. I'm not really a Kiwi at all, although I feel like one. I was born in England and have lived in 8 different countries. 3. I can't crochet to save my life. I've tried but there is obviously a connection missing in my brain that prevents me from learning. 4. I'm terrified of geese and earwigs. 5. I'm ever so slightly obsessed with finding treasure in op shops. 6. I would love to visit South America one day. 7. I have been nipped on the bum by a lion cub and had my toes stood on by a baby elephant (not at the same time). So now for the 15 bloggers who inspire me. Wow that was tough narrowing it down to 15. Off to contact them now. Have a great weekend. We're having a bit of a disaster here in the Cotton Kiwi household involving something small and furry but I shall tell you about that another day! I feel quite honoured and touched! I also like small furry disasters. Can't wait to hear ... though for your sake I hope it's not a little goose or a hairy earwig. Oh thank you so much Sarah, I always love reading your blog and seeing all your beautiful creative projects so feel very honored that you like my blog. Awwww shucks! Thankyou so much Sarah. I'm chuffed to be one of your faves, and I completely agree with the crochet thing - my brain just doesn't get it. I've tried so many times and failed and given up! congrats on your award Sarah, you so very much deserve it! great to get to know you a bit better too. Thanks sooo very much for the mention, you are a sweetie. thank you Sarah, so very much. I love your blog the mixture of family, craft and humour that is disctinctively you.